The artwork on the small wooden crate that holds my 45 rpm record collection. In February when I was packing to move into our new house, I found my record collection of 45s in a wooden crate holder I bought at the long-defunct record store we used to go to called Record Bar. For those of you who did not grow up during the heyday of vinyl records, 45 rpm (revolutions per minute) recordings were released by record companies from the 1950s through the 1980s. These 45s, as they were called, had two songs, an “a” side and a “b” side. The “a” side was the song the record company hoped would become a hit, played in heavy rotation on the radio, and sell a lot of records; and the “b” side was a song thrown in as a bonus. Ever so occasionally the “b” side was a good song too, but not usually. Not only do I still have my 45s from the late ’70s and ’80s, but I also have my LP (long-playing, 33-1/3 rpm) record collection, as well as the turntable I played them on. I do not remember some of these 45s at all. Maybe they were records once owned by friends or former boy friends, who knows. But some of these records are fantastic songs, feature amazing cover art on their protective sleeves, and are musical format that no longer exists. From my experiences looking through 45s at vintage stores, beautiful artwork and lyrics must have began to appear on 45 rpm sleeves in the 1960s. Daddy had a large collection of 45s, but he kept none of the sleeves for his records. Instead he kept them in a set of specially sized albums. 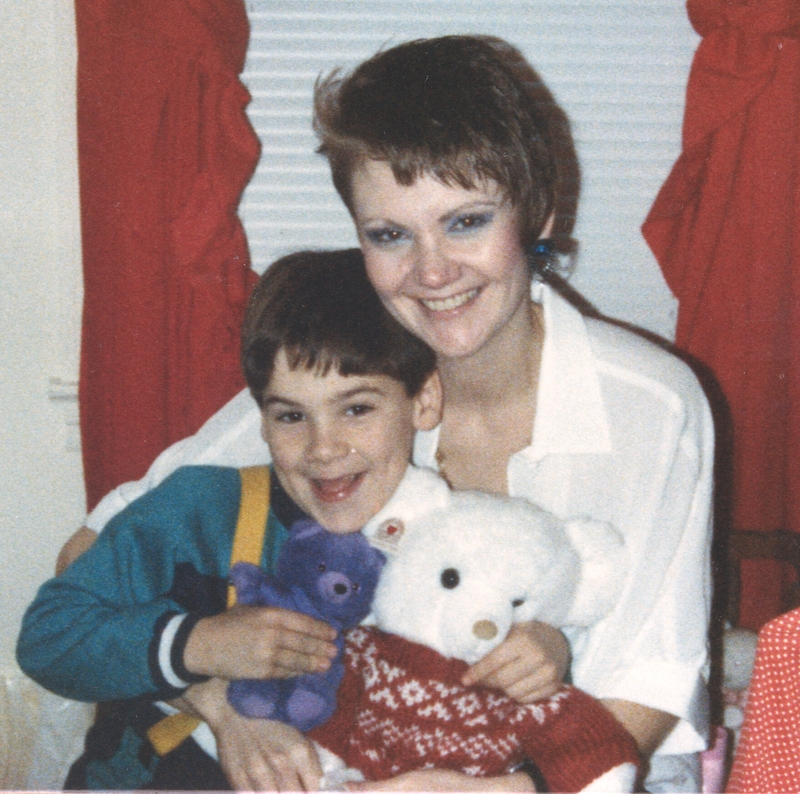 Here I am with my beautiful son Justin, epoxied hair and blue eye shadow, probably 1986. Most of my 45s were bought in the ’80s when I was a divorced, single parent, working full-time, and going to college part-time. As a quick way to catch up on the latest songs, we watched MTV (music television) videos which were a huge part of making hits and selling records in the ’80s. The visuals of these mini movies, married with driving dance music, made Madonna queen of the decade, along with British New Wave bands, and American “big hair” metal and rock bands. Big hair was not just for rock bands, however, we 20-somethings wore our hair bouffed up pretty high. I had, what my former boss dismissively called, epoxied hair, along with blue eye shadow, of course. Snapshots of me from that decade show both. Throughout the 1980s, I bought my favorite records on 45s, recorded them on cassettes, and listened to them religiously as the soundtrack of my life. 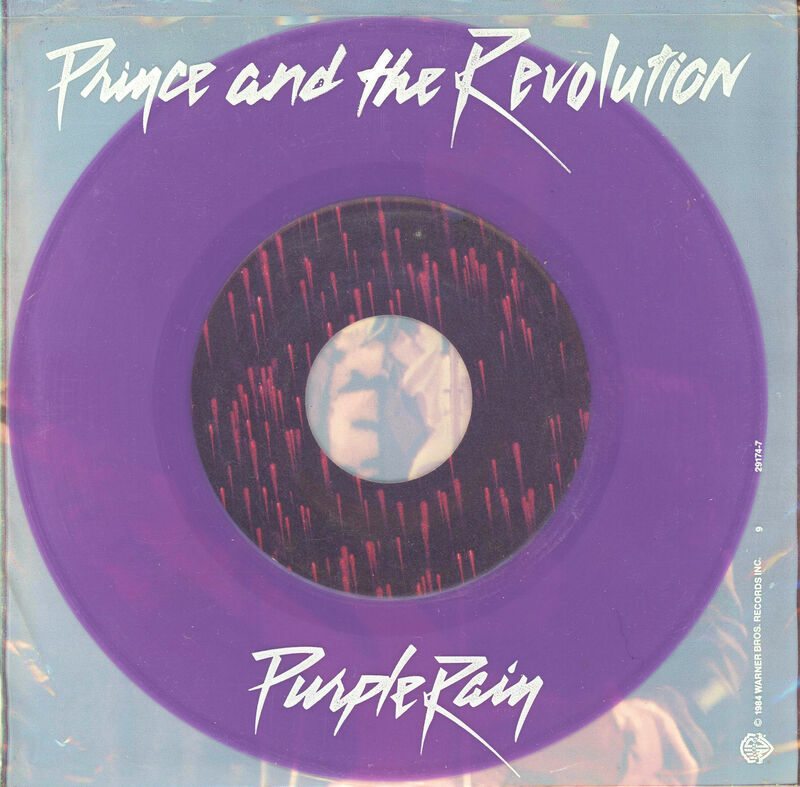 Here is the transparent back sleeve of Prince’s gorgeous 1980s anthem “Purple Rain” with the purple, 45 rpm record showing through. Simple, but highly effective artwork. The king of 1980s music was the provocative genius of a singer/songwriter/guitarist, Prince. His song Purple Rain, recorded with his band The Revolution, was one of the three monster hits released from the soundtrack album for his hit 1984 movie of the same name. Although the song’s lyrics are simple on their face, Purple Rain’s music combined with Prince’s singular guitar solo, was an electrifying anthem that inspired those of us who were young in the ’80s to live life with passion and not to settle for lives devoid of meaning and community. Timeless, then, the song continues to resonate today. 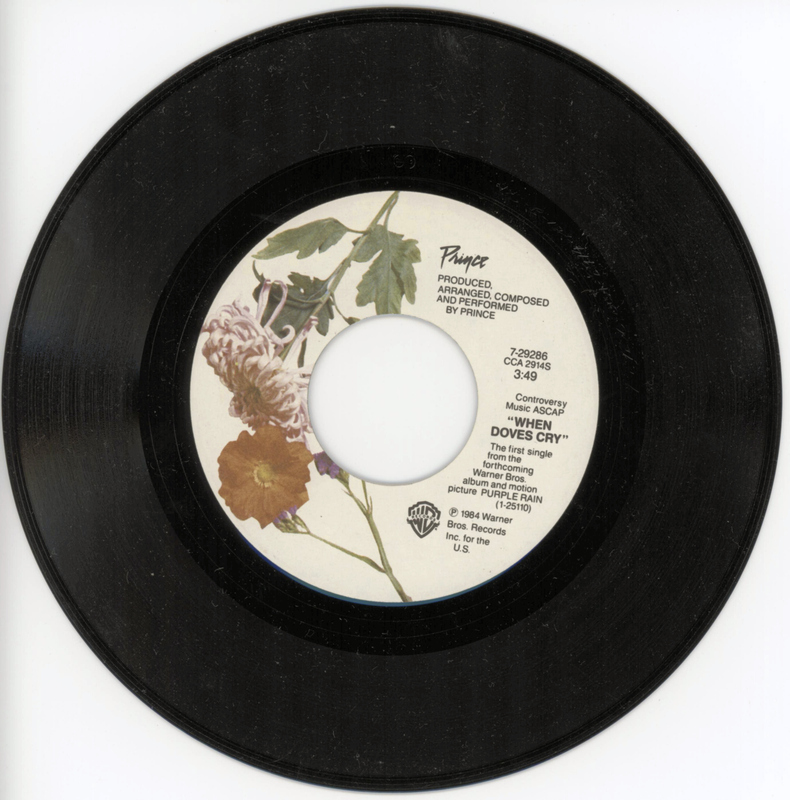 The label for the 45 rpm recording for Prince’s “When Doves Cry”. Also in my 45 collection is Prince’s other hit, When Doves Cry, which hit number one on the singles charts that year along with Let’s Go Crazy–which was frankly not my cup of tea. I preferred When Doves Cry and its sumptuous video which inspired not just the record-buying public, but so many musicians who followed in Prince’s wake. 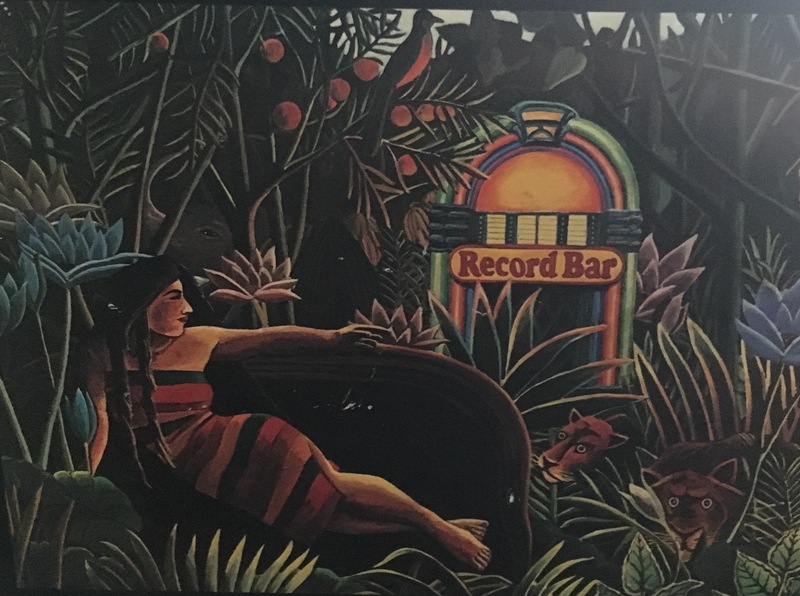 The matching artwork on the label and the back cover of the 45 sleeve, are standout examples of the cover art that is lost in today’s culture of streaming and downloading music. 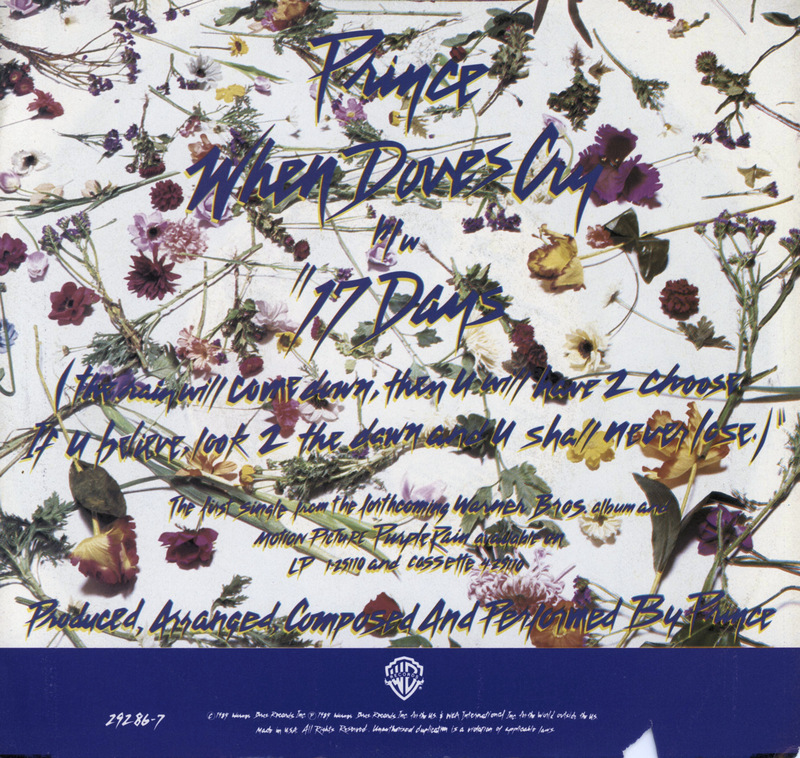 The back sleeve of Prince’s single “When Doves Cry” which was released before the movie “Purple Rain” in which it is featured. When I grew up in the ’70s and ’80s, we pored over the lyrics printed on record covers. I memorized the words, sang along with the music, and studied the list of musicians who played on each song. Today song lyrics are available on the web, but the artwork and information contained in LP and 45 rpm liner notes are mostly not available to present-day music lovers, and much is lost without it. There are a few albums available on vinyl now, but not the majority. The music industry has never really recovered from the loss of its standard modus operandi of recording albums, releasing singles on 45s, and pushing radio play to score hits. Also in 1984, British rock/New Wave group Talk Talk released their single It’s My Life that was also a big hit as a cover song for American ska group No Doubt in 2003. Although the lyrics are mostly about love, the song has always spoken to me about the freedom to live my life on my own terms, and not allow anyone else to define who I am. Hey, and it’s also a great song–both in the Talk Talk and No Doubt versions. 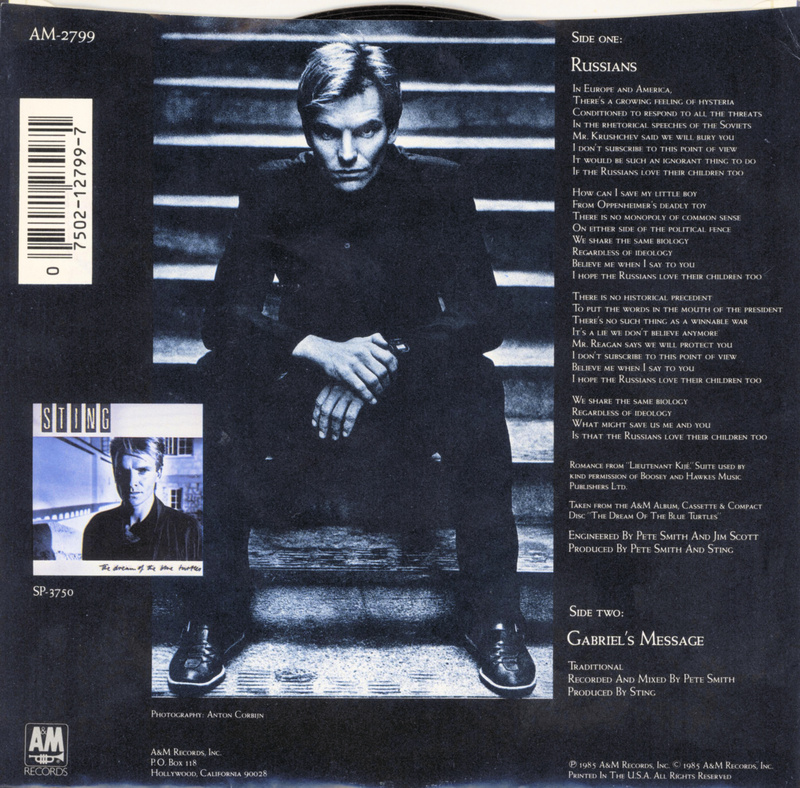 The back of the 45 sleeve accompanying Sting’s 1985 recording “Russians” which he co-wrote. We do indeed share the same biology, no matter our beliefs or skin color. Sadly with nuclear proliferation today, we would need to add many more names to the number of countries, besides the U.S. and Russia, with nuclear weapons. And we continue to hope they love their children enough to allow them to grow up without the no-win-for-anyone outcome of nuclear war. American band The Motels, originally from Berkeley, CA, released this hit single in 1982 on Capitol Records. 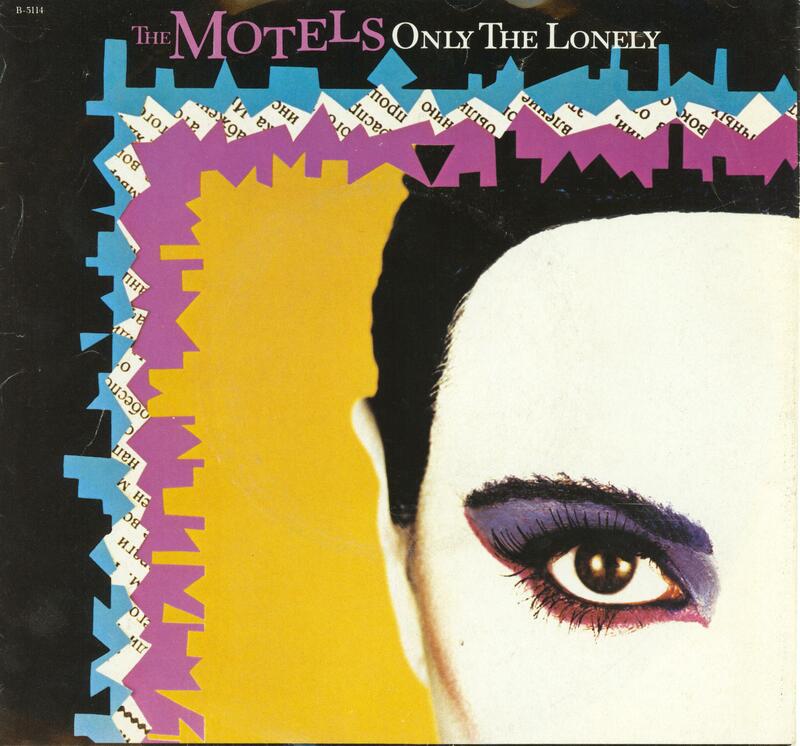 In 1982 the American New Wave group The Motels reached number 9 on the Billboard hits chart with their song Only the Lonely. Written by lead singer Martha Davis, the song had heavy radio rotation and spoke to me when I was a single striver. The 45 sleeve for the single features gorgeous art on the front as well as the back. 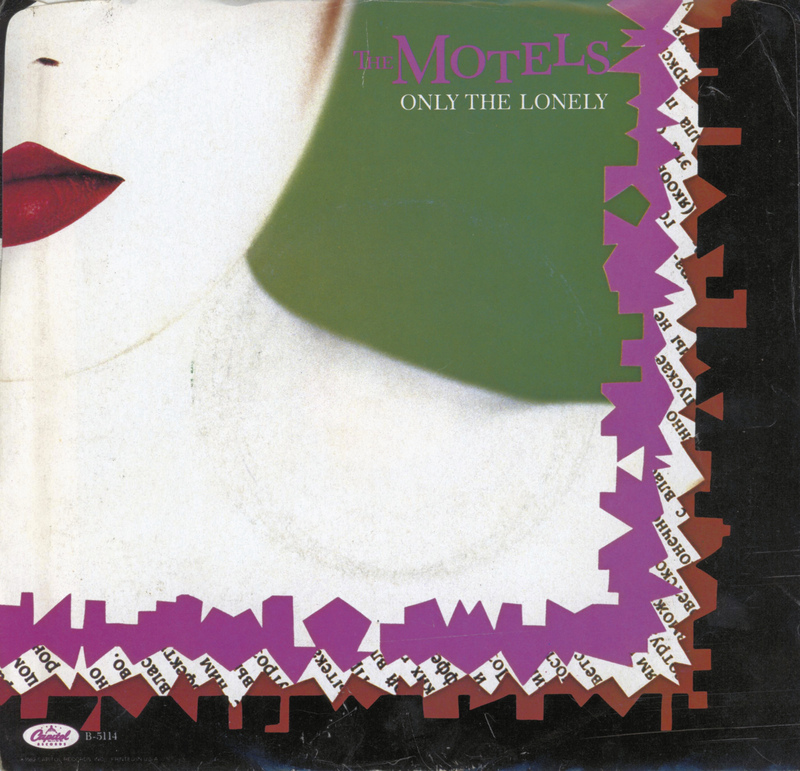 The reverse artwork on the 45 rpm single recording of “Only the Lonely” by The Motels. This song perfectly evokes the 1980s decade as I lived it: a time of flux and transition, with more than a bit of backlash to the gains that women and minorities had achieved in the two decades that came before. We had no Vietnam War to protest, and we did not stare at our navels in the way 1970s-era young people are accused. We tried to express ourselves with our clothes and, embarrassing to us now, our hairstyles, but we also fought to earn our independence in a similar way. And, as at anytime, that road can be a lonely one. 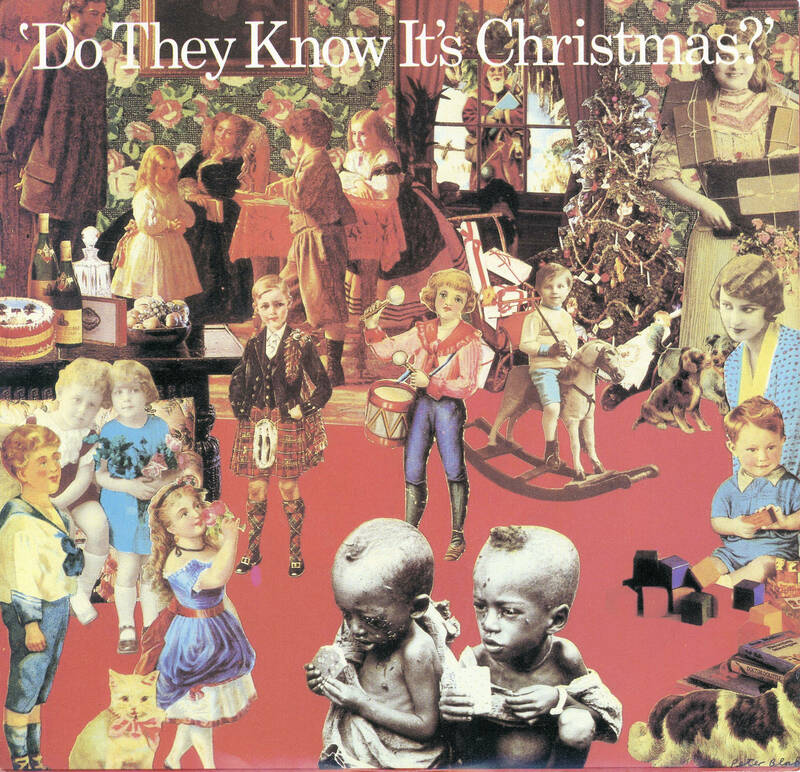 The cover art on the 45 sleeve of the Christmas 1984 recording “Do They Know It’s Christmas?”, a collaborative effort by top musicians to aid famine relief in Ethiopia. In 1984 a group of British, American, and Irish musicians, called “the cream of the pop music talent” on the 45 sleeve’s reverse side, included Sting, Phil Collins, Paul McCartney, U2, and Wham. The musicians collaborated on a song called Do They Know It’s Christmas? and released it under the name Band Aid just before the ’84 holiday season. The recording’s proceeds (including merchandising, performance, and record sales) were donated to famine relief efforts to help the starving people of Ethiopia. The artwork was as memorable as the effort was well known and highly effective, selling 2 million copies and raising $24 million. The song no doubt saved many lives and eased the suffering of thousands of destitute Ethiopians, and it was the beginning of a number of charitable recording collaborations in the following decades. 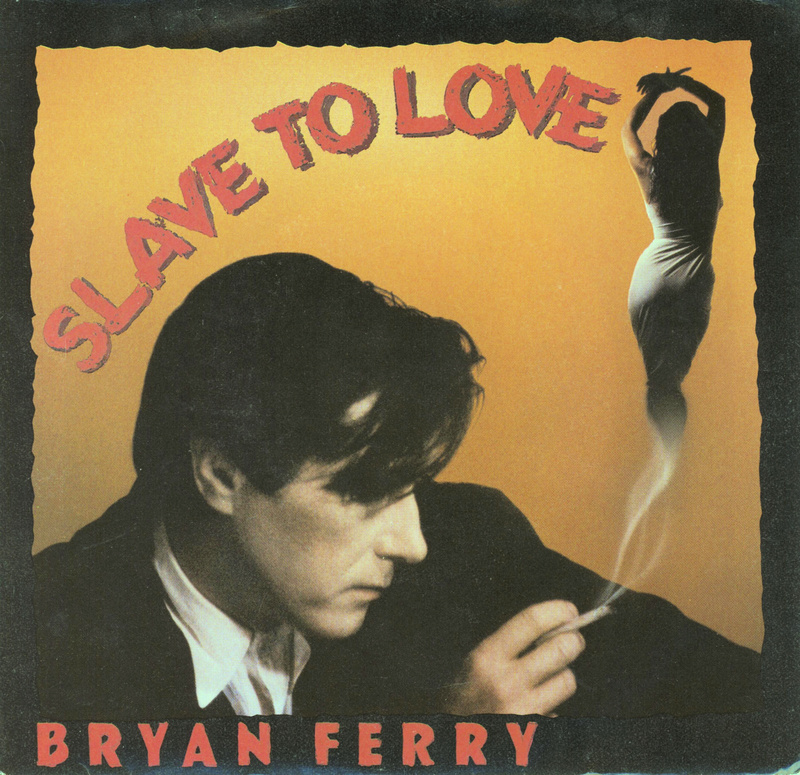 On its 45 sleeve cover, British singer/songwriter Bryan Ferry’s “Slave to Love” effortlessly captures the song’s mood and sensuality. One of my favorite love songs of the 1980s was beautifully seductive Slave to Love, written and sung by British singer/songwriter Bryan Ferry. The video that accompanied its release in 1985 was a perfect accompaniment to the song. 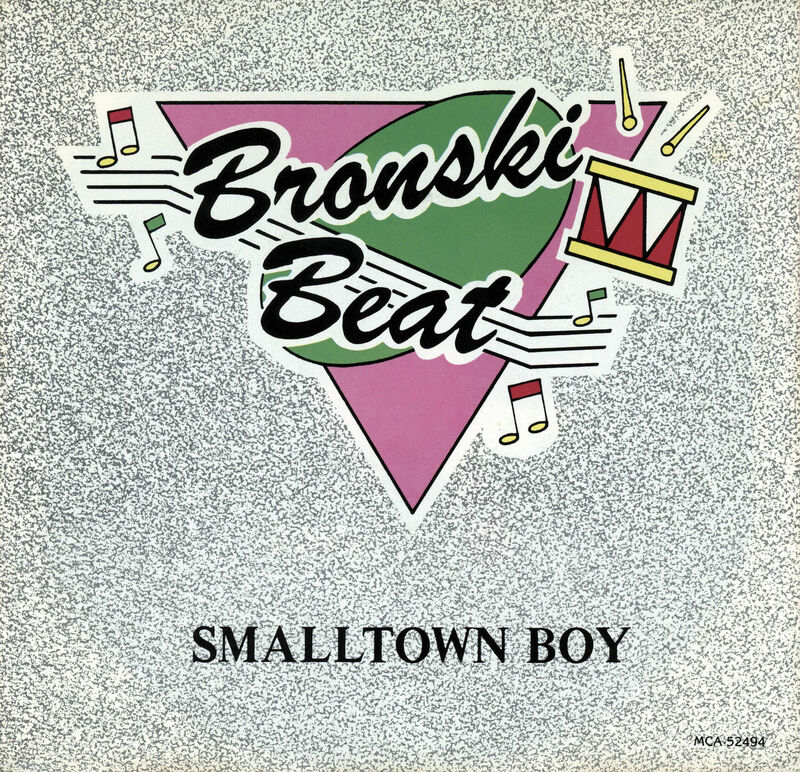 The cover of Bronski Beat’s 45 rpm recording of the song the trio wrote together and called “Smalltown Boy”. In 1984, the British band Bronski Beat–with vocals by their lead singer, the divine vocalist Jimmy Somerville–released their recording “Smalltown Boy”. Written by the three members of the band, the song can be easily understood by anyone who feels they are not completely understood or accepted in their family, hometown, high school, or by the people they grew up with. This song perfectly encapsulates the isolation of feeling unwanted, being an outsider, and seeking a place to be yourself and to truly call home. I spent a good deal of my early years and quite a bit of my life relating to this song. My current favorite song from my 45 collection is the one I sing now to my 7 month-old grandson: Welcome to Heartlight. When I sing Heartlight to my grandson, he watches me intently, then beams, and starts bobbing up and down while holding onto the side of his playpen. He is completely irresistible! Kenny Loggins was inspired to write this song by the writings of students who attended a school in Southern California called Heartlight. Also in my 45 crate are the powerful rocking Love Is a Battlefield by Pat Benatar, The Right Thing by soulful Simply Red, Twilight World by Swing Out Sister, The Rose by Bette Midler, the ethereal and magnificent Life in a Northern Town by The Dream Academy, ‘Til Tuesday’s Voices Carry, Dress Me Up by Madonna, Crowded House’s Don’t Dream It’s Over, Quarterflash’s Harden My Heart, and maybe 70 or so more. Although 45 rpm singles are not the music vehicles of choice anymore, the 45s I listened to in the ’80s are just as transportive now as they were then. Love, growing up, loneliness, finding my voice, trying to make a difference–that was me in the 1980s–and that’s still me in the 21st Century. Great music is the best companion for traveling the adventure of life. 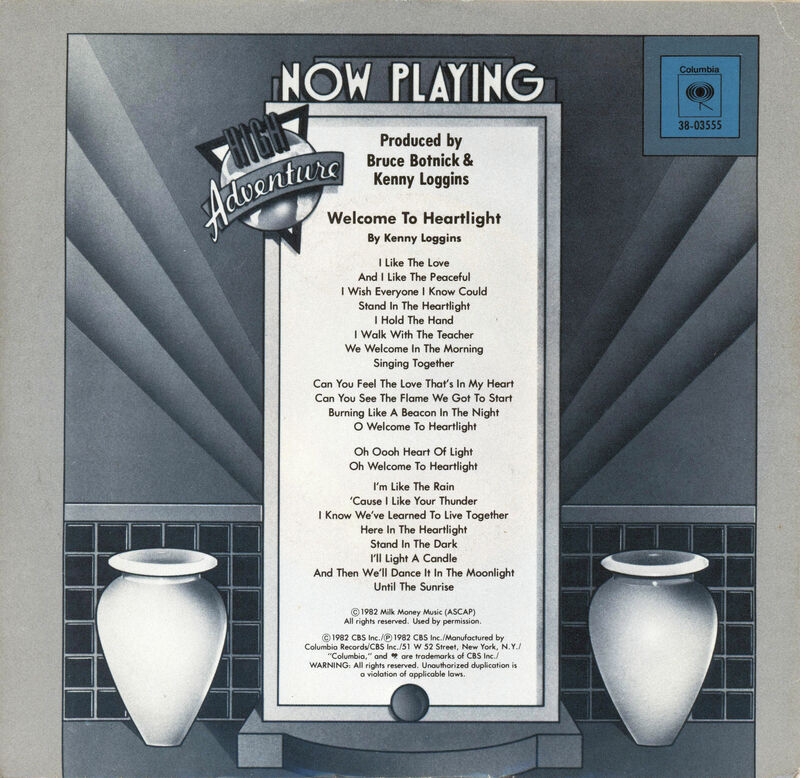 This entry was posted in Autobiographical, Creativity, Joy (Joie de General), Love, Music, Op/Ed Thoughts, The Arts and tagged 45 rpm recordings, 45s, Band Aid, Bette Midler, Bronski Beat, Bryan Ferry, Crowded House, Do They Know It's Christmas?, Don't Dream It's Over, Kenny Loggins, Life in a Northern Town, Love Is a Battlefield, MTV, Only the Lonely, Pat Benatar, Prince, Purple Rain, Quarterflash, Record Bar, Simply Red, Slave to Love, Smalltown Boy, Sting, Swing Out Sister, The Dream Academy, The Motels, The Rose, Welcome to Heartlight, When Doves Cry. Bookmark the permalink. What a fun life with 45 records to listen to and look at the artwork. They sure do define an era and bring back wonderful musical memories. Well done!! !